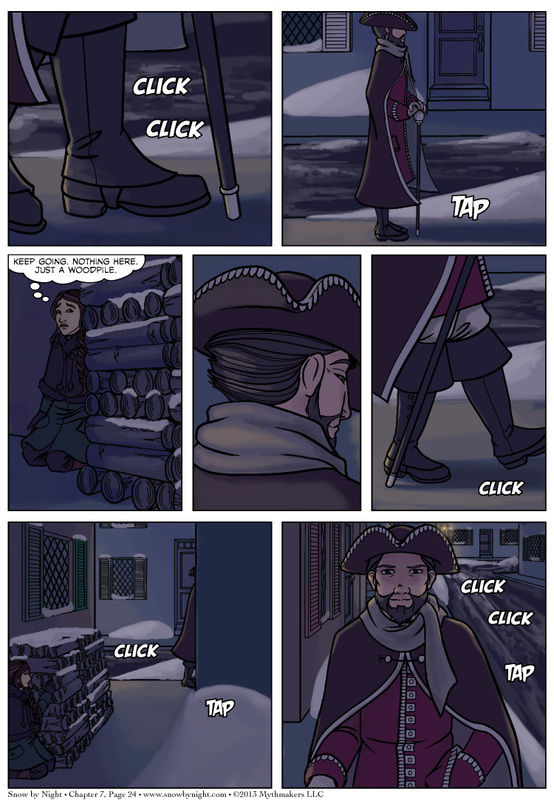 Mathilde hides from the sinister stranger on Chapter 7 Page 24, but he’s not a stranger to us. To see a preview of the next page, please vote for Snow by Night on Top Web Comics. This week’s Spiderforest Webcomic of the week is Dream*scar, by Heather Meade. It has some of the finest lettering I’ve ever seen in a webcomic. That last panel. That face. Yeah, seems like Cienan has some supernatural powers of perception. Perhaps he could smell her perfume? Or any other smell she might give off after walking through the woods. Yeah good point, it could just be that. I could’ve sworn it was gonna be Blaise.